Dear Lisbeth, With lots of practice through your guidence and instructions, I am beyond excited and pleased to inform you that Tina has conquered her fear of brooms and mops! It took about a month, slow consistent practicing and desensitizing, and I am now at a stage where Tina literally follows me around, tail wagging and smiles, while I clean the floors! Another fear checked off the list! Thank you so very much for your continued support throughout our journey. With the private training we took with you, then Confidence Class, and now Agility with amazing Glenda- Tina has turned into this confident, joyful, and content little dog that just loves life. School is Tina's absolute favorite thing and I am so glad to have found Cowichan Canine. Thank you for everything, to both you and Glenda for all fun we get to learn and experience. Tina's quality of life she so very much deserves just keeps getting better and better! Thanks Bev, You are totally awesome and a great teacher. 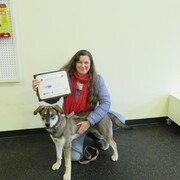 Thanks also to Lisbeth for her puppy socialization classes, and to Karen and Laurie. We took these classes as a condition of our breeder's contract, and we are so glad we did. It all began with your wonderful puppy socialization classes – little Fred was so happy to meet other little ones, and we learned a lot about dog etiquette and grooming. And then it progressed to Foundation where finally I could put a dog into a “down” without begging (eg our two other goldens now in doggie heaven) and could walk around the neighbourhood without the dog walking me! I think Fred is a happier and smarter puppy because of your training style. Woof woof from Fred! And a big thank you from us!